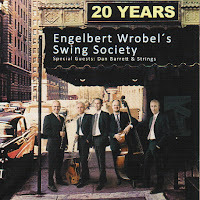 bebop spoken here: CD Review: Engelbert Wrobel's Swing Society - 20 Years. In this case, it doesn't matter as the music speaks for itself. Lovely mainstream/swing that brings to mind Goodman's Sextet, the Gramercy Five (sans harpsichord); John Kirby; Dave Shepherd; Harry Parry. Wrobel, as fluent a clarinet player as any of the current crop, although George McDonald and Matthias Seuffert run him close; also plays soprano and tenor. Maybe I'm wrong but I guess that clarinet is his main instrument. Likewise, Dan Barrett who, as well as playing mighty fine trombone, also sneaks in on trumpet. His composition Long Live the King is a tribute to Benny Goodman although it could easily have been applied to Jack Teagarden after his trombone solo. Serenade in Blue, with the string quartet added, is a knicker dropper of a song for ladies of 'a certain age'! The problem for 'gentlemen of a certain age' is in following it through! 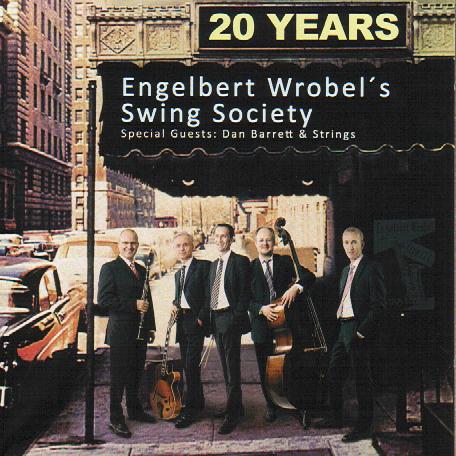 Best just to enjoy the piano solo and dream... A solid rhythm section and an occasional, pleasing, intrusion by the string quartet make this the kind of band you wish you could hear more often at your local jazz club. Oscar Pettiford's Tricotism features Heller. A helluva bass player!